According to The Sunday Times, a ROAD covered in a thin layer of solar panels is going to built in the United Kingdom next year. 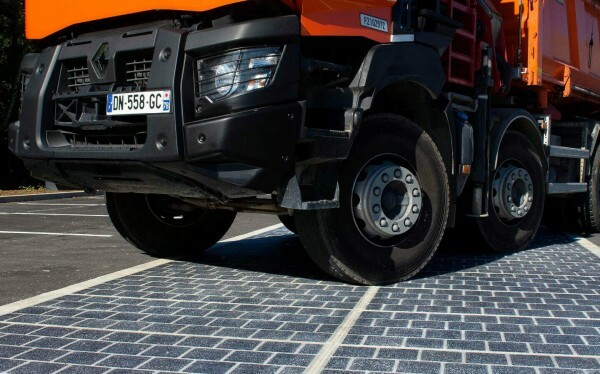 The ROAD is designed and covered with a layer of a quarter-inch photovoltaic material that can be glued over the top of a traditional road surface. Engineers who are currently working on the project attest that the material is durable enough to withstand lorries driving over it. A subsidiary of the French engineering firm Bouygues, Colas, is scheduling out testing at three trial sites one of them including a location near Cambridge. Luckily, Cambridge averages about 1,500 hours of sunshine a year. This is good news, considering that areas with 1,000 hours of sunshine a year can service enough electricity to power the electrical systems in businesses and homes. The Engineers working on the project say that leveraging power from the public road system is a more sustainable measure of producing power than large, industrial solar-powered farms. How will we utilize the solar panels? The solar panel roads are developed by gluing the thin material onto cycle path and car packs, the solar panel material is made from glass bead resin that helps give vehicles grip and prevents skidding. Engineers predict that the electricity being generated from the roads will also be used to help power street lights, electric road signs and automobiles. Colas is preparing to launch a trial period of around 100 trials worldwide and has integrated more than half a mile of material in the village of Tourouvre and Normandy. The cost of the road is being reported to consume around £1,697 ($2110.41 US Dollars) and £2,121 ($2637.70 US Dollars) per square metre (10 sq ft), the company hopes to compete with solar farms by 2020.